A well designed room creates ambiance and soothes away the rough edges of the psyche. Lighting is the canvas of any space, setting tone and painting hue across every design element. It deserves to be treated with respect. Too many consider their lighting only after they’ve finalized their design or chosen decor, but it should be an integral part of the architecture. Virtual 3D renderings flesh out designs and test every aspect of the space. They can present your lighting choices with a surprising degree of accuracy and make it possible for you to design your fixtures before you even install your floor treatments. 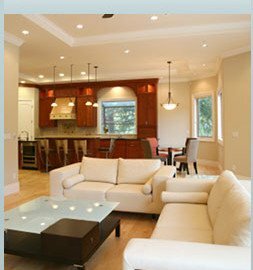 Glare can make dim portions of your space seem darker, so ambient lighting should cover the entire space evenly. Layering allows you to highlight important features, and when it works well with your ambient lighting, accents won’t detract from dark corners. Safety and security features should also be worked into lighting design. Lighting systems and motion detectors keep your space secure while adapting it to different times of day. Cheap light sources tend to create blue-toned glare, so choose high quality systems that let you adjust temperature and color throughout the day. You can achieve a halogen effect with warm LEDs without glare. Lighting must achieve enough contrast to emphasize important design features and hazards. A well layered room has task, accent, and ambient lighting. It draws the eye across the room without creating clutter. Interested in lighting design for your home? Check out Premier Lighting or visit one of our showrooms in Scottsdale and Tuscon. Lighting is one of the core design and build elements in any space. Don’t treat it as an afterthought.